Does not allow solving urgent environmental sustainability issues like biodiversity deterioration, threats of climate change and waste management issues. What if all of these problems were caused by a small “bug” in this “operating system” in which we are living? Simply put, this Root Bug is the fact that labor is quantized into “jobs” instead of being allocated flexibly according to individuals’ willingness to spend and invest – that supply has never really met demand on the individual level in the labor market. The main drivers of this bug are (1) the fact that it is not profitable for employers to share work and (2) that the zero-lower-bound on interest rates (the “minimum wage” of risk-free capital) does not allow keeping aggregate supply and demand in balance, leaving us with a very sticky oversupply of capital and labor. Thus the system has to run at its full capacity to give everyone a chance to earn their living. Spending has to increase at least at the rate productivity increases. This together with natural (and artificial) monopolies makes the system unstable, polarizes income differences and centralizes wealth into fewer and fewer hands. The most significant of these monopolies is the private, untaxed ownership of land, i.e. location. eliminating unnecessary wage (and other) regulations and educational rigidities. The demand for employees (workers) would be decoupled from the demand for labor (work): There would always be competition over employees – regardless of aggregate demand – and thus people would have options of how to make their living and no one could be forced to work for unfair wages or in inhumane working conditions. 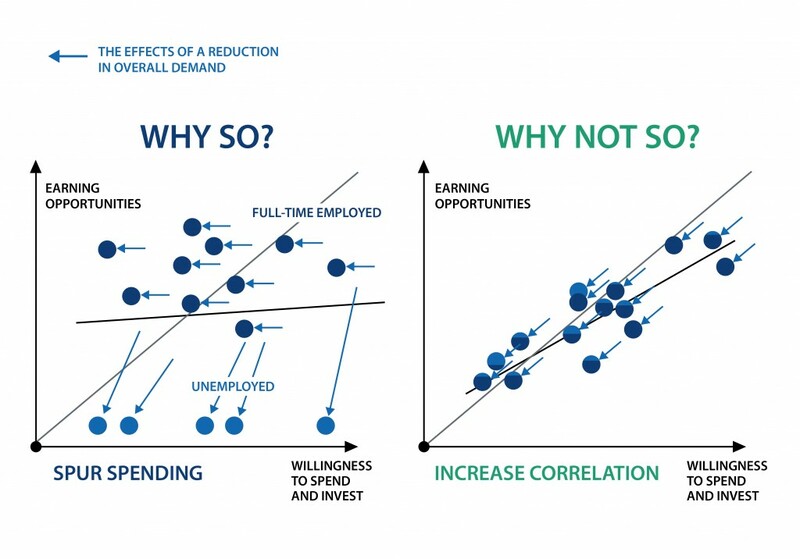 The economy would not require growth to function, but would allow and facilitate just as much growth as people really want – within the limitations of their productive capabilities and environmental sustainability. A Root-Debugged economy would not have to continue fighting the neomercantilist “economy war” (currently popular in developed nations) of trying to indebt other national economies by any means, just to keep itself running. But simultaneously the solution would be so competitive that others would almost have to follow suit, making it a viable option to implement and develop further without a broader international consensus. 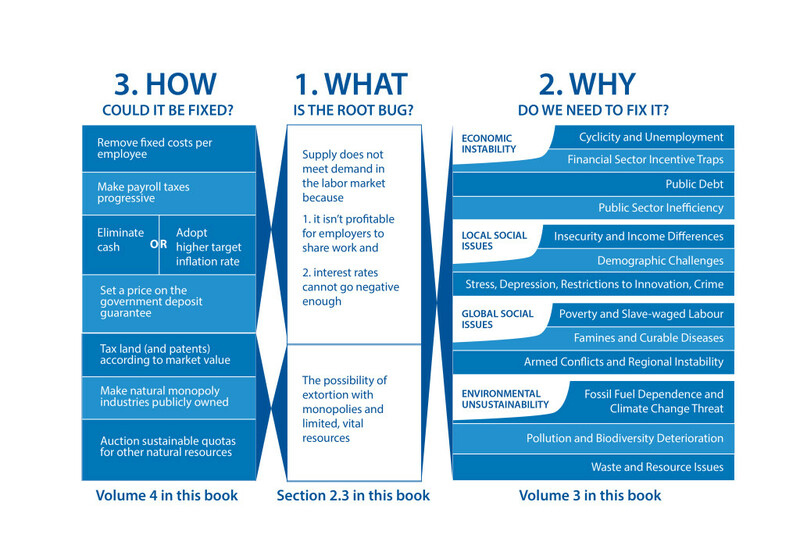 Fixing the Root Bug, with its “societal game design perspective”, is a true pro-market approach, maximizing the positive freedom of citizens to influence their own lives (and also help others) while minimizing opportunities of rent-seeking, usury and exploitation – including making capital obey supply and demand. It can be modified to suit different cultures and other societal objectives. The Root Bug hypothesis is related to Henry George’s idea of a “laissez-faire” economy and Silvio Gesell’s “Freiwirtschaft” and “The Natural Economic Order” – but it is not derived directly from either. It is adjusted to the contemporary world with its ecological sustainability challenges, fast changing and versatile working and consumption preferences as well as new technologies. These technologies have also facilitated an electronic monetary and banking system the dynamics of which are very different from what our outdated economic models (and the languages we speak) still assume it to be. Does this sound completely ridiculous? Yes. The situation is much more so than you would think. Welcome on an adventure into how mankind is being tricked into annihilating itself by simple misunderstandings, emotional fixations to words, misleading assumptions embedded in our languages and outdated moral rules of thumb. Be prepared to question everything you read – but also everything you’ve assumed you know (about money, capital, wealth, companies, happiness, growth, “productivity”, you name it). You can start exploring on this site and the videos and then dig deeper with the book Fixing the Root Bug. Sign up to the Root Bug newsletter. Don't miss out on the action and the new material! Copyright © 2019 The Root Bug - Hacking the economy.